On January 1941 , Arthur Sedgwick left his job at Canadian Fairbanks and his home on Mount Pleasant Road in Toronto and enlisted in the RCAF. His brother William was with the Canadian Army overseas, the family also included his four sisters and one other brother. 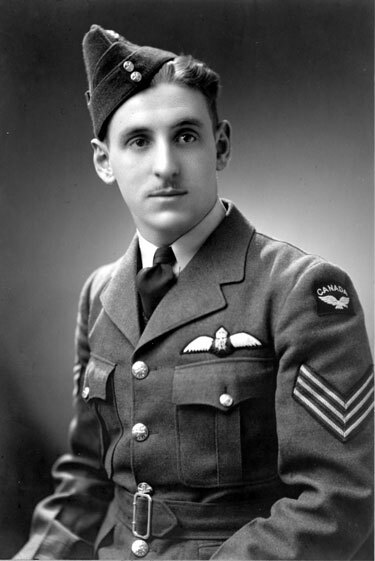 After receiving his Pilots wings at Malton, he was sent to "Y" Depot in Halifax Nova Scotia to await his transportation overseas. The first two letters home were sent from "Y" Depot, one to his father and one sent to his mother. F/S Arthur Sedgwick was killed while on operations on November 18th 1943, staying at the controls of his Halifax bomber to save the rest of his crew. He was 23 years old. I received your letter today so I thought I'd send a few lines to you. My goodness! Your letters certainly sound pretty mournful. I think it's rather silly feeling like that when I'm having the time of my life here and will be having a much better time when I get to England. I'm tickled to death to be going over there. From your letter you would almost think I was going away for ten years, but I'll be back again before you know it. So why don't you cheer up a little. Anyway, they say the war will be over pretty soon. I didn't buy that suitcase, but I did get something that is better. I bought a small folding camera in a leather case the other day. I paid $10.00 for it. This afternoon I went downtown and bought $6.00 worth of film. I should have quite a few good pictures to show you when I get back again. Another friend and I took the ferry across to Dartmouth this afternoon. It's only about a 10 minute trip but it's quite interesting going across the harbour and seeing the different boats. It was such a swell afternoon out today. We took quite a long walk around the city seeing the different sights. We don't do a great deal around here so we rely on walking to get our exercise in. I guess I'll have to be going now to get ready for the dance on the station tonight. So goodbye for now. Things aren't too bad down here at the present time. There is always entertainment at the camp here every night, but I'll certainly be glad to be on my way. I spent a little time today in packing odd things into the large haversack which is attached to our Webb equipment. I suppose you are familiar with what this looks like, which includes the usual water bottle, revolver holster and the inevitable steel helmet placed on the back of the haversack. When we get our gas mask and all this equipment on around us, it will be a pretty heavy load to march the three odd miles down to the docks. We are practically finished here now, so I'll send a cable home when I arrive at my destination, wherever that may be. If this should be England, then I'll certainly look forward with much anticipation to touring this country on any leave that may be given to me. I know I'll enjoy myself as I'm realizing an ambition to see a bit of this world that I probably would never have got. At any rate, it certainly is an opportunity which I'm pleased to get. Well, I can't think of very much more to say, so I'll say so long for the time being-and don't work too hard. I received Mother's letter today, so I'll enclose her letter in with this one. We had a lot of excitement here last night. I was sitting in a pub with another fellow when the air raid alarm went off. Pretty soon a terrific barrage of gun fire was sent up and I could see the enemy planes flying overhead. The sky just looked like the display you see at the Exhibition when the fireworks display is on, only this was on a much vaster scale. I saw one of the planes shot down in flames and go into the sea. It certainly was exciting to watch, but we had to keep under shelter as the shrapnel was coming down like rain on the streets. It's hard to imagine the terrific noise in an air raid until you have actually been in one. On one of our marches the other day we stopped at a very old castle. It is called Starlight Castle, I believe, and it was built in the fourteenth century. Only the walls are left standing now, so of course it hardly looks like a castle at all. It was very interesting to see, though. Last Saturday afternoon I went to Dad's home town. I didn't leave till three o'clock, and as I wanted to be back again for supper, I didn't get to see where your old home was. It's very interesting seeing the country from the top of a double deck bus. You certainly get a good view from the top of these buses. How is business these days? Are you very busy now that spring is coming? I hope you are writing regularly. I have only received two letters from you so far and they were mailed to Halifax. When you do write, don't forget to give me all the news and gossip on what's going on a home. I haven't very much more to talk about so I'll close for now, but I'll be writing an airmail letter in a few days. I suppose you will receive it before this one. You will probably notice that I am now at another station, however this is only temporary so use the other address-No. 3 PRC RCAF Overseas. We are having quite a lot of fun at this station. At least there is always lots of entertainment in the evenings. When I leave this place I certainly should be a lot healthier than when I came. They work us like horses drilling and marching all day. I was going out tonight but we marched so damn far today, I felt too tired to bother so I thought I'd better start writing some letters. I've hardly written any since I came to England. By the way, have you heard anything about that war bond I paid for? It certainly is time they sent it along. I lost the receipt for the money order so I don't know how I'll prove that I ever paid for the darn thing. I suppose you had better pay Billy for the radio. I thought that he wanted $35.00 for it. However, if he wants $40.00, I guess you may as well give it to him. Make sure that people don't run the radio while I'm away. At the present time we are billeted at a house here. The houses are very nice, but as they have no central heating, they are pretty darned cold. We have a fireplace in our room and we buy our own coal to keep it going in the evenings. There is one advantage in these open fireplaces and this is we can make our own toast before we go to bed at nights. We have quite a feast sometimes. As usual, the weather here is still very mild. It's almost as warm here in the North as it is down in the South of England. We were walking past a golf course today and there were people out playing golf, so you can imagine how warm it is. We have to get up at 6:30 every morning and do physical training in just a pair of shorts and a shirt. It's pretty darn cool running across the fields like this, though. Does Jean phone up at all now, Mother? I just finished writing a letter to her tonight. Well, I always seem to run out of news after I get past one page. There never seems to be very much to talk about over here. However, since I've used up all of the space, I'll have to close now, but will write again next week and let you know how everything is going. Keep writing regularly with all the news from home. I was down at Uncle Jim's house the other day and I received your letter dated Feb 28. It seemed funny to hear how cold it was back home when it has been so mild over here all winter. I was sorry to hear that Billy was sick with a cold, but I suppose he is quite well by now. There has been very little happening of which to tell you about here lately. Last week I bought a bicycle and I found it quite handy for getting around in for awhile. However, I was posted to a new station for a few weeks the other day, and I had only been here a day when I sold the bicycle to another fellow. I think I'll buy another one, though, as this station is out in the country and the nearest village is about two miles away. A friend and I walked down to the village last night for a few beers in the pub. The place was full of Gypsies who were camped abut a half mile out of town. It was quite interesting to hear them talk and sing. At the present time we are stationed about five miles from that small city in the centre of England, which everyone heard so much about a year or two ago. It didn't look too bad when we were through it the other day. Uncle Jim's boy Kenneth is going into the Army next Wednesday. He tried to get into the Air Force but his eyes aren't quite good enough for air crew. The other Saturday Uncle Jim and I went out in the afternoon to see a football match between the Army and the Air Force. As it was the first professional football match that I had seen, I found it very interesting. I met quite a few fellows that I knew back home last week. They had just arrived. One of them was in my class at school and another was Doug Cornfield. He worked at Fairbanks Morse with me. He was up at the house a few times so perhaps you will remember him. How is everyone keeping at home these days? Is the big dog still running around the back yard or has the darn thing run out in the street and got killed yet? By the way, let me know how long this letter takes to reach you. These letters are supposed to be air mail, but I understand that sometimes they go nearly all the way by boat. I imagine by the time you get his letter, you will be thinking about going up to the cottage again, or will you have sufficient gas this year? Is Douglas still running his car, or is he in the Army now? In case you didn't get my other letters, did you find out anything about that war bond yet? Let me know if you are receiving my letters regularly. It looks like I am running out of space, so I'll say goodbye for now. I'll be writing again next week. Dear Mother & Dad, I went to the Post Office yesterday and received four letters from Canada. One of them was dated March 16 so it only took a month to get here, which is a little faster than some of them have been. I'm glad to know that you have been receiving my letters. I usually write one a week so they should be coming along pretty regularly. For the first time since I left Canada, I started to fly again last week, and it reminds me very much of St. Eugene back home where I was last summer. We are more or less getting used to the countryside here, and I must admit it certainly looks far different from that back home. We are only here for a few weeks but it is quite a bit of fun. I see that my check has come from the government. I hope you have found out something about the Victory Bond I bought, as I hate to think of that $50.00 as being wasted. By the way, Mother, I hope you have put the records and radio away safely as I am looking forward to using them when I get back home again, so don't let anyone wear the records out. The weather has been very nice around here for the past few weeks. There has been hardly any rain at all since I've come to England, which is hard to understand after hearing about all the rain England is supposed to receive. I imagine by the time you receive this letter Doug will be in the Air Force or Army and I wonder how he will like it? Well, I guess I'll have to close now, but regards to all of you at home and I'll be writing again next week. Dear Dad, I received your very welcome letter the other day and I'm glad to say that it took just a little under a month to get here, which is a little quicker than some previous letters, as some of them have taken five or six weeks. I'm certainly glad to know that business is pretty good these days, although it is a pity that you can't manage to get as much material as you really need to keep up with the demand. However, I suppose there is very little that one can do about it in these times. I received your parcel the other day and I sure was pleased with all the contents that were in it. They certainly will come in handy and the chocolate bars and candy were especially nice. Thanks a million for everything. I have not as yet received the pipe tobacco, but I imagine that it will be coming along any day now. I'm glad to know that you and Mother have moved into my old room. I guess you will certainly find this a lot better than before. In regard to the War Bond, I wrote to the Dept. of Finance and asked them to have this mailed to you at Toronto. I'll be glad when this matter is cleared up. I suppose the family are all anxiously waiting till the end of July when you will all be going up to the cottage for two weeks. I hope that you will get a good rest when you are up there, and I don't have to guess very much to know that the work you are doing now will certainly warrant a holiday. Well, here's hoping that you will catch lots of fish this year. Since I've been in England I have had a really good time and I'm feeling quite at home now. I expect to be flying Wellingtons in another 5 or 6 weeks. They certainly are a huge aircraft. You have no doubt heard quite a bit about them, as they are nearly always mentioned in the newspapers being on raids over Germany. At the present I'm stationed in about the centre of England and liking it very much. Well Dad, I can't think of very much more to say, so I'll say goodbye for now and write again soon. P.S. let me know if you received this letter. Just received your letter the other day and it was swell to hear from you again. I've just finished writing a letter to an old friend of mine who is also stationed at Aylmer. His name is L.F.C. Deane, first name is Bill. I thought perhaps you would like to look him up. I imagine he will probably receive his letter the same day as you receive this one. I was pleased to hear that you managed to get two weeks leave. I hope you had an enjoyable time up at Waubaushene. I hope to be getting a week off myself in another few weeks, however I suppose it will depend on how busy we are going to be. The station I am on at present is pretty good. There are plenty of nice towns that we can get into by bus and train in a matter of fifteen minutes or so. I believe I mentioned in my letter home that my rear gunner and I bought a motorcycle between us. It's a small B.S.F. about 1938 model, and although our gas ration is small, we mange to get around in it alright. How is everything at Aylmer these days? Do they manage to keep you very busy around the camp? I'm having it pretty soft on this station. I very seldom get up for breakfast so I usually lay in bed till 8:30 or 9:00 in the morning, and if I'm not working the next night, or should I say that night, I go into town and see a show. It's really a lazy life, but I love it. I hope by the time you get this letter, you will have been made a corporal. My Flt Sgt came through about six weeks ago and I'll be getting about five months back pay, which will come in pretty handy. I suppose Pinkie is kept pretty busy now that she has a daughter to look after. How does it feel to be a father, Doug? Plenty of worry, I'll bet! Well, Doug, I can't think of very much more of interest to say so cheerio for now-and do write again soon.